I love working from. I love everything about it. It’s an amazing way for me do something I love every day, earn money to do all the fun things I want to do, and not have to worry about commuting in traffic. Plus, as a bonus, I get to spend all day with my puppy. She’s almost 4 now but I still call her my puppy. But it’s not always all roses and flowers here. There are some things you need to know first before working from home. 1. Remote employees are almost twice as likely to work beyond 40 hours a week—and not just on menial tasks, according to a recent report from Inc. Magazine. Workers tend to be 20% more productive when they get to tackle creative projects remotely. 2. A lack of break room distractions often means people can reach goals faster, too. In one experiment that let Chinese call center employees work from home, people got through 13% more calls than in-office staff did. The company not only saved money on office space and furniture, but gained the equivalent of an extra workday a week from each employee. 3. When you give employees the flexibility to control where and when they work, they gain an extra hour of sleep a week to become more attentive and alert, say researchers at Penn State University. 4. Then there’s the simple fact that people tend to work harder when they’re happy—12% harder, according to one recent economic experiment. 5. 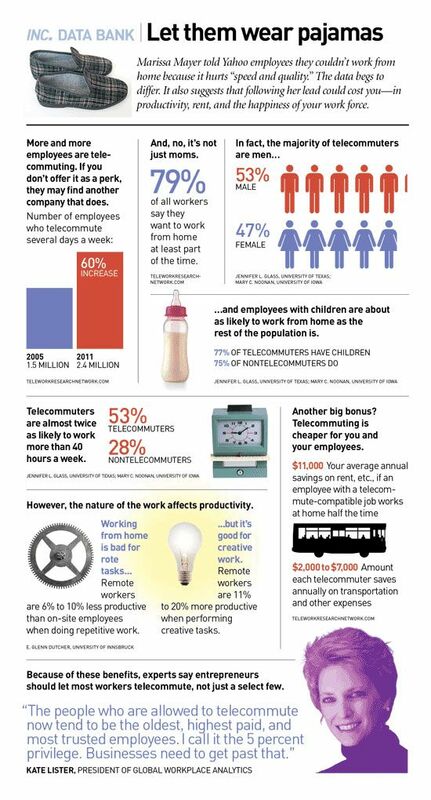 On the other hand, commuters are more likely than telecommuters to feel dissatisfied with daily activities, regardless of how much they’re paid—a fact supported by a recent U.K. Office for National Statistics finding. 6. A Gallup survey of more than 173,000 Americans revealed that extreme commuters—people driving 90+ minutes to and from the office—develop not only high stress levels but recurring back and neck conditions as well. 7. A lack of work-life balance and time away from family takes its toll, too: Another Swedish study found that couples are 40% more likely to divorce when one partner commutes more than 45 minutes each way. 8. A typical business can save $11,000 per person per year simply by letting them work from home 50% of the time, according to a recent analysis by Global Workplace Analytics. 9. And what happened when a snow storm recently forced the federal government to let its Washington employees work from home for four days? It saved taxpayers an estimated $32 million. 10. Research has been revealing for years that the overall job satisfaction and productivity gains of remote work translate into significant (as in $277 million a year significant) savings.